How I teach my young kids about Finances 💰 Financial Literacy for kids. Why don't they teach this sh*t in schools? I can't even begin to tell you how many times I've heard this since becoming an adult. So many people who are having financial problems or have no idea how to establish and maintain credit, purchase a car or a house, save money, etc. It really is kind of funny that the average american child spends so much time in school and doesn't learn very much about real life. I know I never learned this stuff in High School. My daughters are 8 and 5 years old if you didn't know. I know I mention them all the time. As they grow, they want to be more independent and have things of their own. Money is not an exception. Once they realized that they need money to buy treats at the store, they both were constantly asking for money. Not in annoying way, just because they wanted to have their own couple of dollars. So, I told them that if they were ready for the responsibility, they could have their own wallets, and their own money to spend. That they would have to learn to be responsible, and that money is not a toy. They agreed, and we went to the mall to see if they could find wallets that they wanted. Claire's happened to have a pink and purple wallet-their favorite colors. Score! I snatched up, and set them aside for their birthday party. Until the party, I told them all about money. How you need it for everything you do, how you can't lose it, or just give it away. How you have to save money in order to be successful in life. My eight-year-old has already been introduced to money in school and my five-year-old has too, but counting money and learning about what money is is different than learning how to use money and actually using it. Related: Homeschooling is the best decision I ever made for my kids. Here's why. They started off with the money that they received at their birthday party some people gave gift cards and some people gave money. Shortly after their birthday I took them each to the store and let them purchase items with their own money. I started them off small. We started buying donuts at our local grocery store. We can get one doughnut for about $.70. This was good because it helped the kids learn about counting money and it wasn’t too large of an amount for them. I let them each use the self check out kiosk and pay for their own stuff. They love buying their own treats so this was a fun learning experience for them and they’re getting pretty quick at using self check out by themselves the only thing that holds them back is that sometimes they’re too short to press the buttons. Then, I started taking them to stores like Walmart and target where their gift cards before it was hard for them to understand that there was a limit on the card and that they couldn’t buy just anything and everything that they wanted but they were able to pick out little things that they loved and I brought them joy and satisfaction in knowing that they purchased it all by themselves. Every day we practiced bringing your purse with you not losing it in the store not leaving it in the cart not leaving it in the car when we return home keeping your receipts keeping your money organized using coupons and saving money with practice so many things that the girls are just pretty experienced without how they spend their money. Shortly after they began spending their money they began asking for ways to make money. They help me out with car clean out and they earn a dollar. They help wash the clothes here and there they are and they earn $.25 They keep it all in their wallets and they also put some change in their piggy banks. Recently, I created a proper chore chart for them, so they can see how much money they will earn for the chores that they do. Basic things are not considered chores such as making their bed and keeping their room tidy, but sweeping, moping, cleaning mirrors, etc are chores that they are compensated for. After listening to Dave Ramsey (who by the way offers amazing financial advice) I began to realize that the kids need to learn how to save their own money. Yes parents can save money for their kids and most parents will start a savings account for their kids, but I realize that my kids need to have a savings plan that they are actively involved in so that they can become used to the practice of saving money. So I created savings envelopes for each of them. I like savings envelopes just because I’m honestly not a huge fan of banks. I really don’t like banks at all. If they perform all of their weekly chores they will earn roughly 3 dollars a week. I don’t really know if that’s too much money or too little money but right now it seems doable for me to get paid a little bit for each of their chores and they love it and they haven’t complained so so far it’s been working out. Out of the three dollars that they are in per week they are required to put one dollar in savings which I think is extremely fair every week we count the money to see how much their savings has grown into be honest they love it they understand that saving money is very important. I am hoping that by teaching them how to manage their money as children they will have a better understanding as an adult. Some crucial information that must have slipped my parents mind when I was growing up was the Credit Score. What it is, how to establish and maintain credit, and why we need a credit score. I won't do my children the dis service of neglecting to teach them this information. Although my oldest still has 7 more years before we will start establishing credit for her, I want them both to be super educated on this topic. I explained to them exactly what a credit score is. I explained how to maintain good credit. I always do my best to explain things in a way that they can understand. I will ask them simple questions like "If I pay my car payment late, is that good for my credit score or bad for my credit score"? I am more than confident that by teaching kids these skills earlier in life will give them a solid foundation so they can thrive on their own in the future. My biggest mistake in life is not educating myself on finances after my parents and the school system failed. 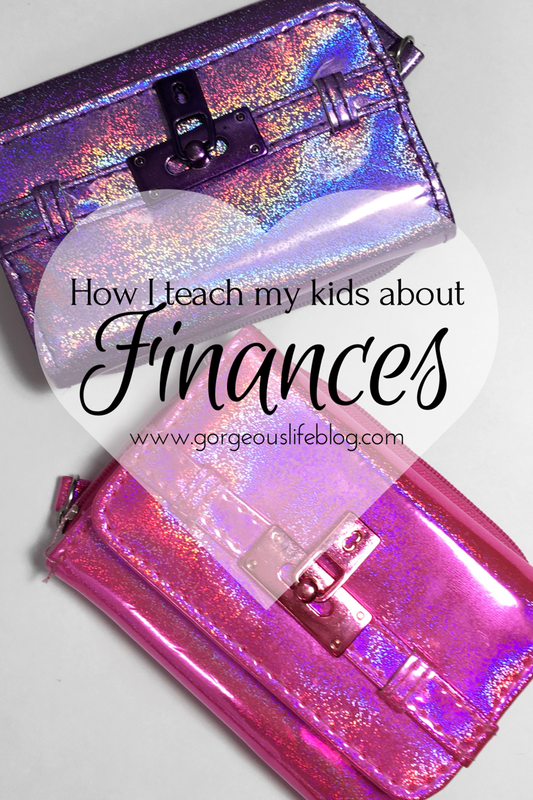 Have you started teaching your kids about finances yet? Let me know in the comments! I love hearing from you!